We have carved the top most position in the list of the most prominent Measured Volume Set Suppliers in India. The materials used in the manufacturing of the Measured Volume Burette Set are of unmatched quality that further ensures unbeatable performance in the respective applications. 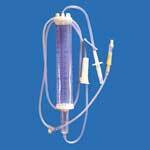 The Cylindrical Measured Volume Set has the capacity of approx 50-60 drops/ml. The length of the PVC pipe is 1500 mm and the sizes available are 110ml & 150ml so as to suit the requirement of the customer.